Your destination wedding should be more than just special – it should be exceptional. Hold your fairy-tale destination wedding in a lush tropical paradise – surrounded by colonial charm, pampered with unparalleled service and spoiled by elegantly renovated accommodations – at The Inn at English Harbour on Antigua, a Caribbean island that’s often called the heart of the Caribbean. • Ceremonial flowers for the bride and groom. Weddings at The Inn start at $1,000 USD and are subject to availability at the time of booking. More than just the spectacular picturesque setting and service set the Inn at English Harbour apart as the ultimate choice for your wedding destination. The elegant and exclusive Inn completed a $1.5 million renovation that blends the perfect balance of historic charm with luxurious and contemporary comfort. This includes all 28 guestrooms and suites as well as the dining venues and grounds, and the introduction of an all-new spa facility and upscale boutique. 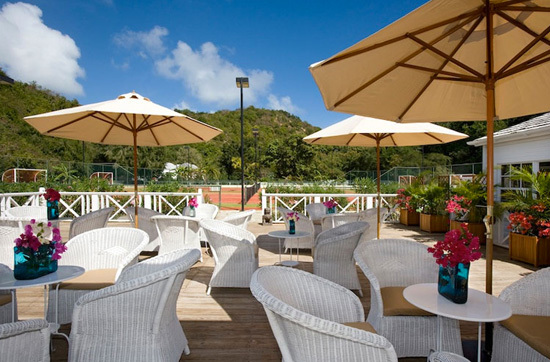 The Inn’s private white-sand beach fronts beautiful hillside gardens for a setting of supreme serenity, yet just two minutes by water taxi reside the restaurants and nightlife of bustling English Harbour. Now more than ever, the historic charm of the resort’s colonial design converges harmoniously with modern-age conveniences and the natural splendor of Antigua to present a uniquely 21st-century take on paradise. The Inn's highly acclaimed Terrace Restaurant intensifies the romantic atmosphere with its rustic, stone walls, candlelit tables beneath a star-filled sky, and the posh flair of English Silver Service. As prelude to this perfect interlude, you’ll want to share an island cocktail (or two) in the friendly warmth of the Reef Restaurant and Beach Bar. For more information on the Wedding Package at The Inn at English Harbour, please call +1 (268) 460-1014. More information on the resort is available at The Inn at English Harbour's website. Ideally located on the captivating southern coast of Antigua, The Inn at English Harbour combines picturesque beauty and historic legend in an intimate boutique resort. Colonial-style cabanas and two-story villas house 28 regally appointed guestrooms across 19 acres of wooded headland near the entrance to English Harbour. Rooms feature marble or mahogany floors, canopy beds, spacious modern bathrooms and verandahs or balconies. Each has been recently upgraded with flat-screen televisions, iPod docking stations, air conditioning, and Wi-Fi internet access. The fine dining Terrace Restaurant with wine cellar reside in The Inn’s original stone house amid landscaped gardens while the popular, casual Reef Restaurant sits on the soft white sand beach. Additional amenities include an intimate spa, an infinity-edge pool, tennis courts, a library/tea room, an upscale boutique, and a private white-sand beach. Two minutes by water taxi resides the nightlife of English Harbour. St. John's is approximately 18 km away and the international airport 20 km.